Twenty-two years ago Bob and Joyce Lane visited our church. Their grandchildren had recently started riding our church bus, and they wanted to see the church the children were attending. Bob (a World War II veteran) and Joyce were already saved, but after they joined Lancaster Baptist, many of their family members soon trusted Christ and were baptized. Yesterday the Lanes celebrated their 60th wedding anniversary, and I had the joy of sharing this celebration with them. Several of our members collaborated with their three sons, daughter-in-law, and granddaughter for a surprise visit with cake and ice cream. I read several verses of Scripture from Ephesians 5, and Les and Angela Wall sang “He Touched Me” (Bob’s favorite) and “Let Me Call You Sweetheart.” We finished our time of fellowship with sweet testimonies of the impact the Lanes have made on all of our lives. Pastoring the people of Lancaster Baptist Church is a delightful privilege. I praise the Lord for couples like the Lanes who are a testimony to our young people of faithfulness, commitment, and love. 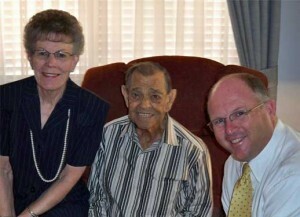 And I praise the Lord for the sixty years He has given Bob and Joyce with each other. Knowing and serving with people like the Lanes is a great honor.